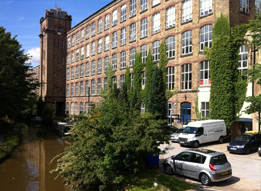 The Adelphi Mill provides office space to business ranging in size from sole traders to multi-nationals. 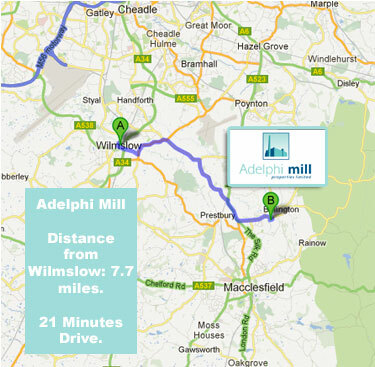 The Adelphi Mill is Located just 7.7 miles (21 minutes drive) from the centre of Wilmslow. 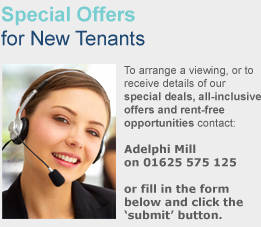 For businesses looking for Wilmslow office space to rent or let, this makes the Adelphi Mill Office Space Macclesfield a great choice. Office Space to rent and let in the Wilmslow area at Adelphi Mill. 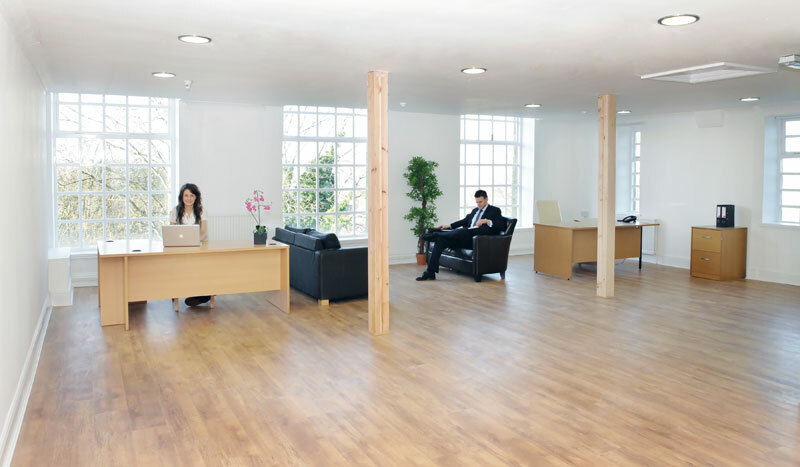 Why choose office space to rent and let near Wilmslow? Office space to rent or let in the Wilmslow area at Adelphi Mill. Wilmslow is an ideally placed town just on the outskirts of Manchester City centre. Lying only three miles from Manchester airport and ten from the centre of Manchester with all its shops, restaurants and city living, the Wilmslow area is an ideal location for office space Wilmslow at Adelphi Mill and perfect for businesses who want the best of both city and countryside worlds. Businesses who take up the Adelphi Mill, office space Wilmslow, could be close to some affluent potential customers due to Wilmslow’s reputation for being home to some rich and famous residents. The towns’ expensive housing and boutique, designer shops and location near to Manchester has attracted some Premiership footballers and their WAGs, actors as well as the regions wealthiest businessmen to the area. Office space Wilmslow would therefore be a great advertising opportunity in front of wealthy clientele for businesses as well as a prestigious postcode in which to base a business, as it is in fact the third most affluent area in the UK after Kensington and Chelsea. The famous reputation takes us all the way to the top of the power system of the country as Wilmslow is in the constituency of Tatton which is represented in the House of Commons by current Conservative chancellor George Osbourne. Why base your business in office space in the Wilmslow area? Office Space Wilmslow would offer staff of businesses that take up this opportunity a chance to live in one of the nicest areas in Cheshire by working at an office within the Adelphi Mill. The town has easy access to Manchester’s sporting events, shops, nightlife and restaurants is another attractive option for staff whilst the immediate Wilmslow area maintains its small town or even village feel with its estimated 25000 but growing population. The recent move to base a large majority of BBC broadcasting from London to Salford in Manchester is an indication that big business is slowly moving north. This is sure to bring more business further north, attracted by the cheaper office prices and larger office space. Basing a company in office space Wilmslow would be a smart, future proof move as the Adelphi Mill is well placed both locally and nationally. Located in a green, wooded area the office space at Adelphi Mill would give great views to staff working inside to every direction and would provide a relaxing view while working. Wilmslow also offers a range of high quality schools of all age ranges as well as lots of sporting opportunities, as you might expect given the proximity to two of the country’s best football clubs. A happy workforce bodes well for a happy business and this is what office space Wilmslow would offer, a nice place to work, access to the best restaurants, shops and events as well as a prestigious location for a business to advertise.